After buying a new monitor, you may become disappointed if it starts flickering while playing full high definition videos, games etc. Many Windows 10 users have this unexpected experience. This article explains how to fix monitor screen flickering while playing HD videos, games etc. Basically, This problem appears more on LCD displays. When you play 1080p or 4k videos, the monitor shows a black screen for less than a second and then appears normally. It seems to much annoying. Especially, Your 50/60Hz monitor may blink more when you try to watch videos in full-screen mode. But, Don’t worry. You can get rid of it. There may be two reasons behind this problem. One is physical, another one is software. Fortunately, You can fix both issues. Here are the ways to do it. If you have NVIDIA or AMD graphics card, you may fix this problem by tweaking a thing on the graphics card settings. 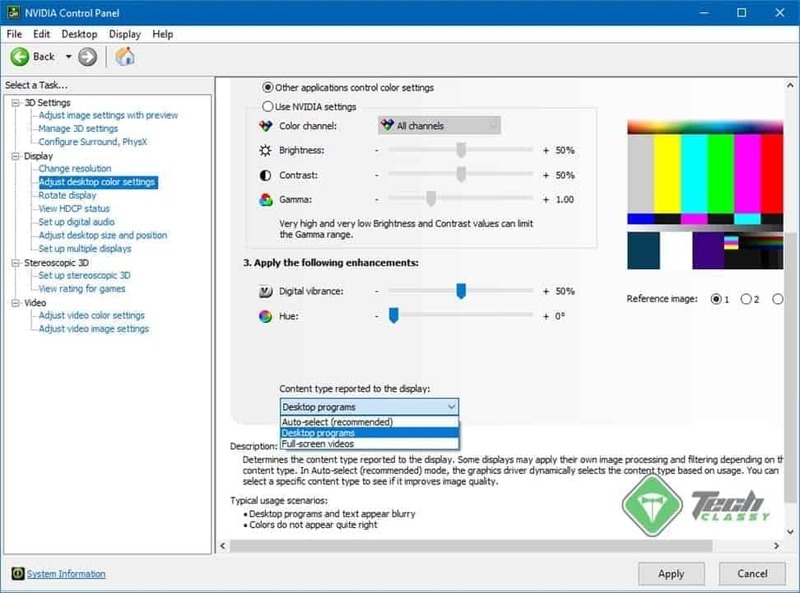 For NVIDIA, Just open the NVIDIA Control Panel and then go to Display > Advanced Desktop color settings. Now, Set the content type to this display as Desktop Programs or Full Screen Video. From now, You should be able to play videos or anything without having screen flickering issues. For AMD graphics card, you may find similar options and apply the appropriate settings to fix the monitor screen blinking issue. Sometimes, Outdated graphics card driver software can be a reason behind this problem. A similar problem also may appear when you don’t have an appropriate driver installed for the graphics card. In this case, You should install the latest driver by downloading from the official websites. After downloading, Install it. I hope the problem won’t appear anymore. By the way, You can use Driver Booster to update or install all of your drivers without any hassle. It has a free version. But, You may want the pro version. In this case, You can grab this 65% discount on Driver Booster Pro. You may encounter monitor screen blinking issue due to HDMI cable problem. So, Check the monitor is connected with your CPU correctly or not. Also, Check if the cable is totally OK. If you start experiencing this problem right after upgrading or installing a GPU, contact the graphics card manufacturer support to get proper solutions. Some user may face this problem with a new monitor. In this case, Try any other monitor. If you see other monitors are not flickering and you are facing the problem with just one monitor, you can either contact support or retailer to have a new one. I hope these tips will help you to fix the monitor screen flickering problem while watching high-quality videos on Windows 10. You can let me know your feedback, questions or opinion on the comment box.